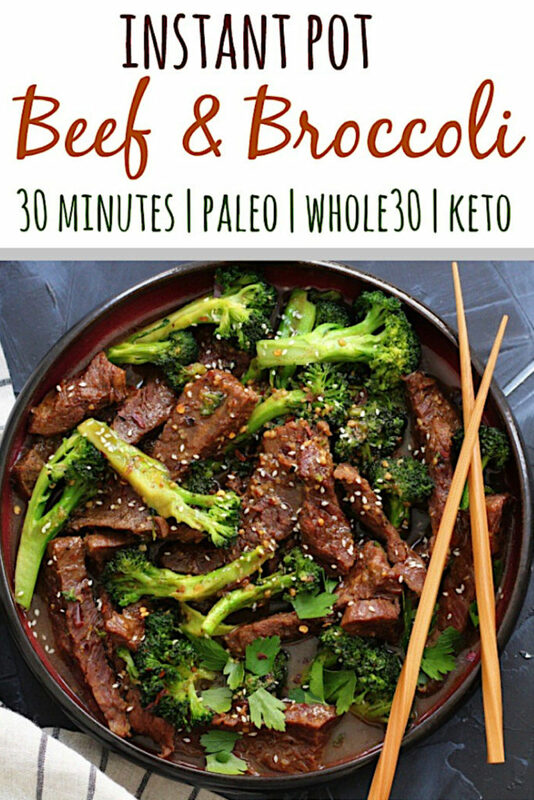 Instant Pot Beef and Broccoli: Whole30, Paleo and 30 Minutes! I’m combining two of my favorite things today. My instant pot and Chinese food! 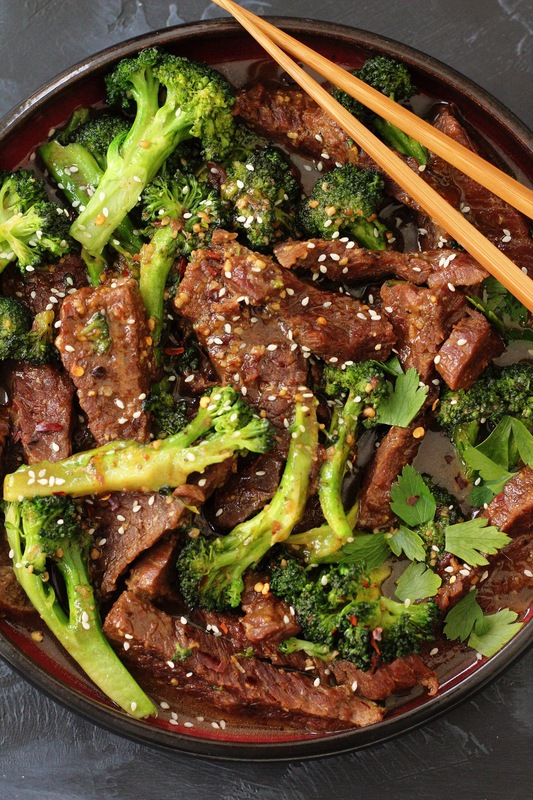 This Whole30 instant pot beef and broccoli is about a million times healthier than the beef and broccoli you would normally get in your takeout order. It also happens to be a quicker option too, with only 30 minutes needed to put this on the dinner table! Got your attention now didn’t I? Thought so! I remember when I first got my instant pot this summer and was terrified of it. I remember writing in the first recipe I posted here about how it looked like a spaceship (haha!) and that I was so nervous to use it. Compared to my slow cooker that has two buttons for low and high, this contraption felt like I needed an engineering degree to figure out. But, alas, I managed, and now I couldn’t imagine life without it. Bonus: my kitchen hasn’t exploded (yet). 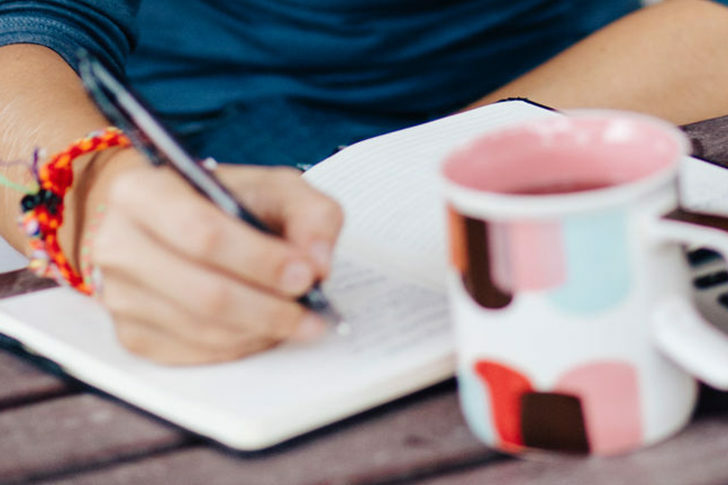 If you’ve been hesitating on getting one for yourself, I’m here to tell you it’s worth it. Not only for easy 30 minute meals from start to finish, like this beef and broccoli or my chicken taco soup, but even for batch cooking! I love using it at the beginning of the week to cook a bunch of chicken breasts to dice or shred, pork, taco meat or roasts so I have a go-to protein for the week. For this instant pot beef and broccoli, you can use flank steak or a beef chuck roast. If you use a chuck roast, make sure to trim any extra fat prior to cooking. Those cuts of beef typically are a bit fattier, but they’re also cheaper so it’s a good budget option! Instead of a typical soy sauce (Paleo = no soy), I use coconut aminos. You can pretty much get coconut aminos anywhere nowadays. Target and Walmart even. My favorite brands are Big Tree Farms and just the Thrive Market brand because it’s way cheaper and I go through this stuff like water sometimes. I DID tell you I was a huge fan of Chinese food at the beginning of this, remember? I did link to Big Tree Farms on Amazon, but just to show you what I’m yappin’ about. It’s way cheaper on Thrive Market per bottle (like half the price) so just a heads up there. Thrive Market gives you 20% off your first 3 orders as well, so you can maximize your savings there too. 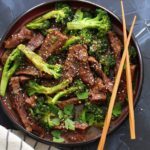 The other ingredients used in this simple Whole30 instant pot beef and broccoli recipe are sesame oil, which is a staple for creating the well known Asian flavor in dishes. Along with using arrowroot flour as the thickener instead of cornstarch. Some other options for thickening sauces are tapioca starch, coconut flour or gelatin. For my tips on cooking with gelatin, check out this post! 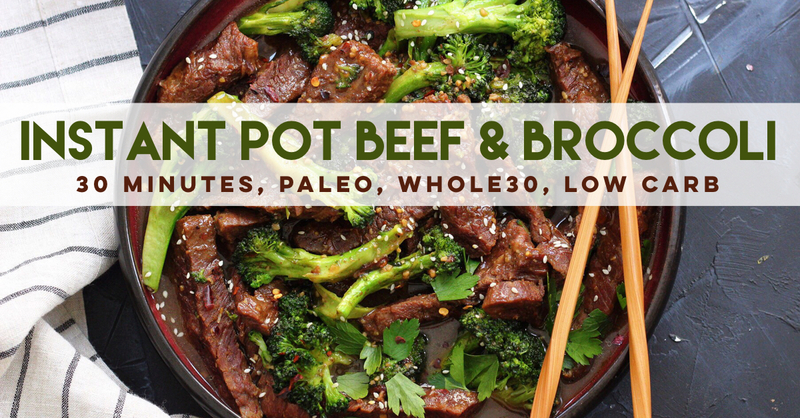 This Whole30 instant pot beef and broccoli is great served with cauliflower rice, broccoli rice or just on it’s own! You can make it for a quick weeknight dinner, or use it for your next meal prep. It makes plenty of servings to get you some delicious lunches for the week! Enjoy! Turn instant pot onto “sauté” mode and add avocado or olive oil. Optional way to cook broccoli: Once done the beef is done, do a quick release, remove lid, place in broccoli. Close the lid again, set to 0:00 on manual, and set to “sealing” to steam broccoli. This will cook the broccoli more thoroughly as opposed to lightly steaming it for more fork tender broccoli. Then continue with step 7. This looks great and I plan to try it. I too was terrified of my Instant Pot at first. I am wondering though, with having to cook the broccoli separate and sear the meat, what is the benefit of using the Instant Pot over a pan for this one? I LOVE this recipe! So easy! I’m glad you include to steam the broccoli in the microwave so it doesn’t turn to mush in the ip. I steamed mine for a minute less because I didn’t use the full amount. Perfect! Thank you so much!! So happy to hear this! 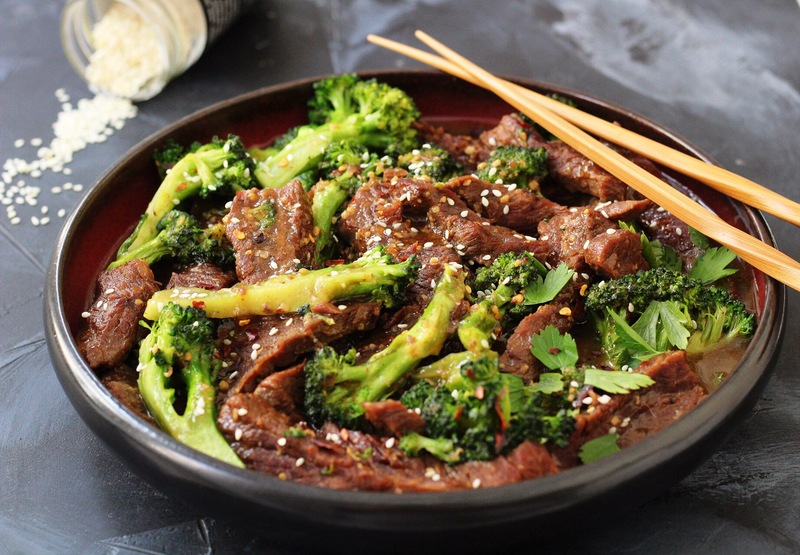 I like my broccoli more fork tender for Asian-inspired recipes and this is an easy way to do it! Thanks for stopping by to let me know how it turned out. It means so much to me! I loved this! I added ginger to the sauce, which was a nice addition. I also put the steamed broccoli in the pot and cooked it on high pressure for 00:00. Came out perfectly! That sounds great!! Thank you so much 🙂 I’m glad you enjoyed it, Amy! 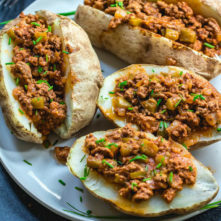 Can you add how you would cook this in a crock pot? Hi there! I would have to test that method before adding instructions on it being it’s a different cooking method. The IP does the searing, pressure cooking and thickening the sauce in one. I don’t want to give you the wrong instructions on doing that in the slow cooker being it would require doing parts of the cooking on a stovetop as well 🙂 Hopefully one day I can test a slow cooker version and share exact cooking times! Made this tonight and it was so yummy!!! 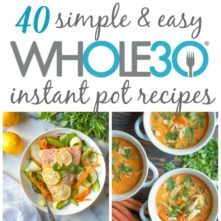 First time using my instant pot and this recipe made it feel so easy! My husband couldn’t stop eating it! Ahhh! That’s awesome! The instant pot can be really intimidating – I let mine sit in the box for a while before I tried it 😉 Thank you for comin’ back and letting me know!! Made this and lived it. We all fought over the left overs! 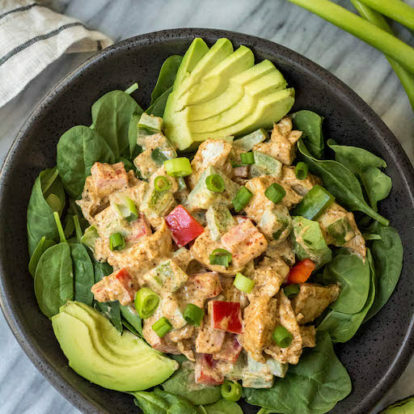 This is THEE best Whole30 instant pot recipe I’ve ever made… and.. i’ve made alot. THANK YOU! Woo! Huge compliment! Thank you! Haha!! So happy you loved it! My husband asks for this meal at least once a week! And when we first started dating he would complain when I put vegetables on his dinner plate….so thank you for working so hard to make and post these!! This was so tasty! BUT, the meat was still a little tough… should I have sliced it thinner? Let it naturally vent for longer? Will definitely make it again, the flavour was delicious! Especially with a spritz of srihacha at the end! yum. Hi there! So happy you loved it! As for the beef, it could be a number of reasons, so I can’t say for sure without seeing how thick it was cut :). It could depend on the what the thickness was like you mentioned, or if it was cooked a bit too long when seared which would leave it overcooked and tougher as the end result, or that the tenderness of steak simply varies by quality of the beef. Sorry I couldn’t be of more help there!! Wow this is insanely salty. Any suggestions? Hmm.. Did you use salted beef broth by chance? That’s the only thing I can think of being the recipe only calls for 1/4 teaspoon for 1.5 pounds of meat. But, if that’s too salty my suggestion would be to omit the salt or add 1/8 tsp instead! 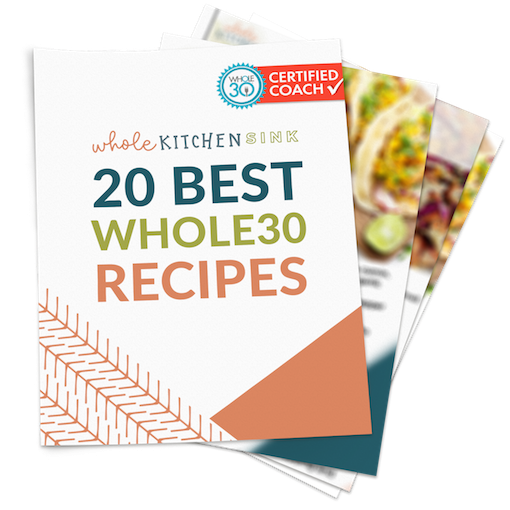 This is my favorite Whole30 recipe!!! Trilled to hear it! Thank you! This came out pretty good, but completely lacking in Asian flavor. The sauce had more of a regular gravy taste to me. Would you recommend anything to enhance the flavor? Thanks. You can try adding 1/2 tbsp of fish sauce to the sauce, or additional black pepper, ginger, or red pepper flakes to taste! Love this dish!!! I do struggle with the searing part though. I do it on sauté medium, but it takes 5 or more minutes before it unsticks and then it’s completely cooked through. Is my pan too hot, not hot enough, or do you just scrape it up after 1 minute or so, and not worry about it? I was weary of this recipe being bland, but it was SO GOOD. My entire family (5 year old included, so I halved the amount of red pepper) loved it. 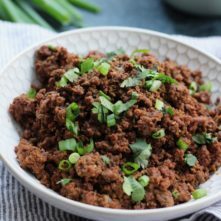 I’ve been struggling to find good replacements for my dinner staples since becoming dairy-free and this is definitely going to be made frequently here! I’m so, so thrilled to hear this, Dani! Thank you so much for coming back and letting me know! Oh good!! I’m so so glad you enjoyed it! Ahh! I LOVE to hear that!! Thank you so much for letting me know – I’m so happy you liked it! Yum! My husband and I agreed this was better than takeout and pretty easy to make. The meat came out so tender. I steamed broccoli on stove and just threw it in and stirred. Will make again! I’m so happy to hear this! Thank you, Anne! I have a regular stove top pressure cooker. How do I adapt your cooking instructions for the broccoli? If I put the raw broccoli in after the beef is cooked, how long should it cook? I’m sure it’s a short time. I like my veggies crisp tender. Hello! Can you help clarify the steaming of the broccoli? You mention “quick release” when done – so do you mean let the pot come to pressure then release? I tried to do some research but it was a little confusing! Quick release just refers to what to do with the steaming valve to release the pressure. After the pot beeps when it’s finished, you have the option to do a slow pressure release by keeping the valve/toggle set to “sealing” instead of venting- that method takes about 10-15 minutes for the pressure to release before you’re able to open up the instant pot. Quick release would be toggling it over to allow the steam to vent out and the lid to open much sooner :). Additionally, you can just steam the broccoli in the microwave for 2 minutes and just mix it into the beef to skip that step 🙂 Hope that helps!! Would it be possible for you to provide nutrition facts? Its sooo tasty, but I always log my meals and I’m not sure how many Calories, etc. to log. Thanks so much! They’ve been added! I’m glad you enjoyed!! I was wondering what the taste difference is with regular soy as apposed to the coconut aminos? 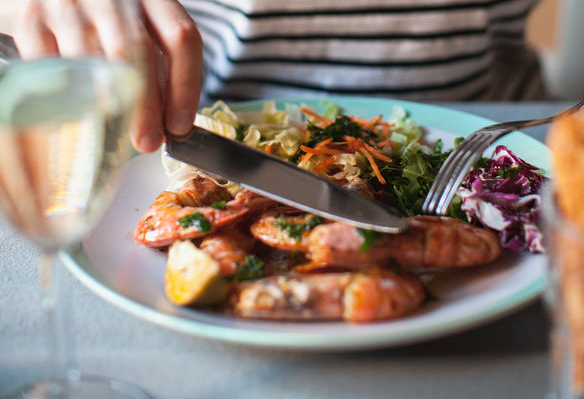 What exactly is Paleo? Tried this tonight and we LOVED it! The meat was perfectly tender and the broccoli had the right amount of crunch. 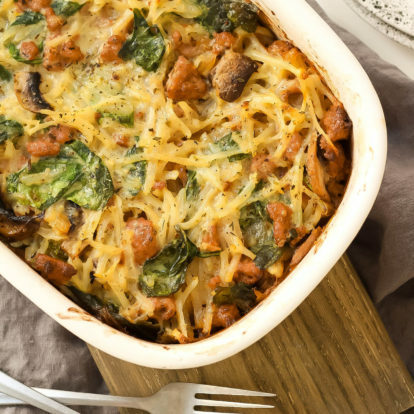 This recipe will definitely be part of our meal rotation. Also, this is only the third recipe I have tried in my instant pot I got for Christmas ???? Thank you, Samantha!! I’m SO happy to hear this, and so grateful you made my recipe!! Thanks for coming back and letting me know! So bomb! Like everything you have made for us. Thank you. Delicious and easy. This was fantastic! Def. the BEST IP recipe I have made to date!!! Can’t wait to try more from your site! So happy to hear that, Gina! Thank you so much!! Hey! Love this recipe but just wondering if it really is 1/2 cup of aminos? Tried to convert this to weight watcher points and its 12 points just for the coconut aminos. Just wondering! It’s for the sauce, and when divided between 4-6 servings, it’s less than 1/4 cup per serving. I’m unfamiliar with WW and their points / what other options are- but you’re welcome to use soy sauce or tamari or whatever other soy sauce replacement you use! Really good but a bit too salty for me. Next time I’ll omit the salt and probably add some mushrooms, red peppers and pea pods. Thanks for sharing it with us! Can almond flour be substituted for the arrow root? I wouldn’t, as almond flour acts as more of a coating (think chicken nuggets) instead of as a thickener which is essentially what it does for the sauce in this recipe. It’s also much grittier than the arrowroot starch. Tapioca flour would be a better sub if you have that! I’m glad you liked it! 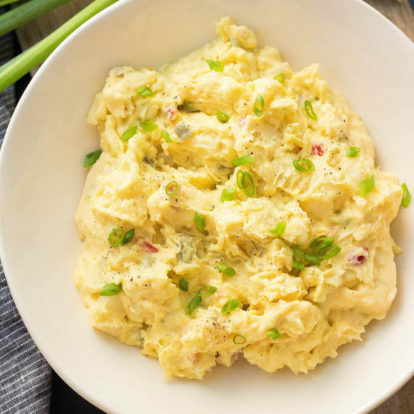 Only 1 tablespoon is used in this recipe and there’s 7 grams in 1 tbsp of arrowroot- so it’s the exact same carb count as the 7 grams you said is in 1 tbsp of cornstarch. There would also be 28g of carbs in 1/4 cup cornstarch. Bailey! This recipe is legit. So freaking good! SO happy you loved it!! Thanks, Lauren! This is seriously the best recipe I’ve ever made. Even better that it’s whole 30!! My whole family loves it. This was my second meal ever in my instapot and my husband said it’s literally a “game changer” ???????????? thanks for the recipe!!! Oh thank you so much!! I’m thrilled to hear this! Oh this is wonderful! The stew meat sounds really good too!! Thank you so much – so happy you both enjoyed! Very good! I didn’t change a thing. Perfect recipe and we loved it! So happy you enjoyed! Thank you, Helen!! This was delicious! My husband was initially leery because I did another Whole30 asian inspired recipe that didn’t turn out so well. His first comment was, “Do you have plans for the leftovers?” because he wanted first dibs on them! Glad we have another easy recipe to put in our rotation! Love this!! Thank you so, so much!! I just made this and it’s SO yummy and comforting (Asian food is my fav!). I don’t have an instant pot so I just made this in a skillet. Oh good! I’m so glad you enjoyed 🙂 Thank you so much, Megan! Tasty and easy but crazy salty. we used low sodium beef broth and low sodium soy sauce and even used less than suggested and I still feel like I just destroyed my heart. Highly recommend using NO sodium beef broth. 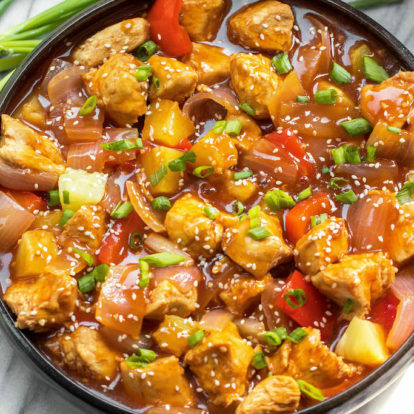 It’s much more likely to be because you used soy sauce which has 880 mg of sodium per 1 serving, and low sodium soy sauce has 575 mg of sodium per serving – as opposed to coconut aminos, which is what this recipe was created with, that only has 90 mg per 1 serving. Even low sodium soy sauce would yield a result 6x saltier than it would compared the recipe followed as written. Made this last night and I cannot believe how delicious it is! Since I have a lot of mouths to feed, I doubled the recipe. Living on the central coast of CA, we have a cut of meat called tri-tip and that’s what I used. So good! I used broccoli from Costco and since it comes in big chunks, my daughter cut them up so the florets were the size of a fingertip. When the meat was done and I released the pressure, it was still piping hot so I dumped in the broccoli and mixed it around with the meat and sauce for 1 min. I removed the meat and broccoli into a bowl to then thicken the sauce, and covered it to steam broccoli further. Perfect! This recipe is a keeper! Wonderful! 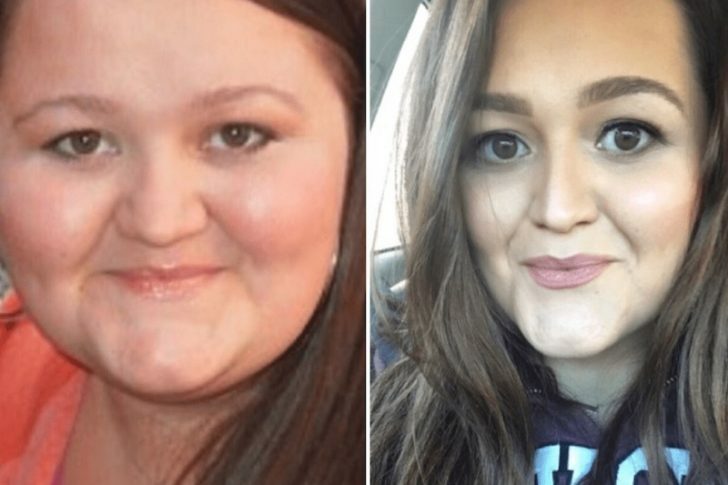 Thank you so, so much for sharing, Christina!! 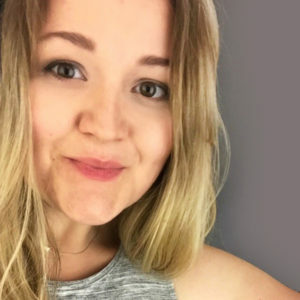 Hey Bailey – Everyone loves it!!! Just wondering if you have the nutritional data/macros. THanks so much for your blog, is amazing as well!! !